Do you ever wake up with tired, inflamed, puffy skin? If you said yes, this beauty hack is going to be everything. This beauty hack is a serious wake-up call for your skin, and has been used for centuries due to its effectiveness. Lets get real, people wouldn't be voluntarily rubbing ice cubes all over there faces if it didn't work...I sure wouldn't. The reason ice can aid in such a range of common skin problems is that cooling your skin constricts the blood vessels and encourages the body to send more warm blood to the affected area. The increased blood flow reduces swelling and restores uniformity to your skin, which helps to solve many common skin complaints. I used this hack a-lot while I was going though acne, and I still use it today for many reasons. I've put together My Top 5 Fav Benefits To Facial Icing. Before we get into These 5 Tips, when applying ice to the skin be sure to wrap the ice cube in a soft cloth before applying it to your skin. Wait until it starts to melt slightly before gently massaging your skin with the cube in a circular motion. Be particularly gentle around the area under the eyes, and make sure not to use ice immediately out of the freezer, as it will be too cold. 1. Calms Puffy Eyes. Ice refreshes your eyes. It causes the blood vessels to tighten and reduces the swelling. Wrap the ice cubes in a towel and press against your eyes for a few minutes. If you are in a hurry, a splash of cold water can have a similar effect. Rinse your face with cold water and enjoy the sensation of coldness as it wakes you up and tightens your eyes. 2. Makes The Skin GLOW. Have you ever gone for a walk in the winter and came inside to a beautiful pink glow? Everyone wants radiant and glowing skin, and an ice massage on the face can give you just that. 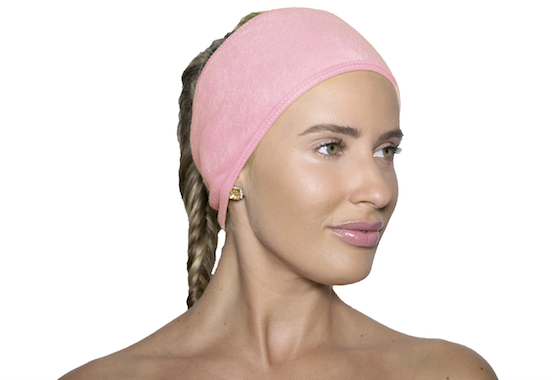 It improves blood circulation to your skin and makes it bright. 3. Promotes Circulation. Cold constricts the blood vessels so that less blood goes to the surface of the skin (which reduces any inflammation or swelling). The body responds by gradually sending an increased flow of warm blood to the area. Circulation improves the elasticity of the skin, refreshes the skin, and gives you a glow. In this way, fine lines and wrinkles are also minimized. And, since your circulation is now improved, all of those serums and moisturizing creams will work better! 4. Blemish Banishing. Another bonus of icing acne prone skin is it helps the antibacterial and topical antibiotics get into the pores. that is because icing makes the skin surface more permeable, because the cold reduces inflammation that has become swollen and clogged the pores.Swollen skin makes it difficult for topical creams to reach bacteria inside of the pores. Once you reduce inflammation, the pores will become unclogged and they will open. This also helps other pores from becoming clogged. 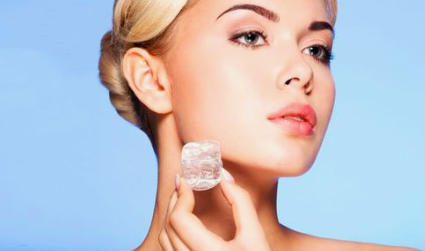 Gently rub the ice cube over the affected area where the acne treatment will be applied to cool the skin. Rub the ice over the area for about two to three minutes or until the skin is wet and feels cold to the touch. 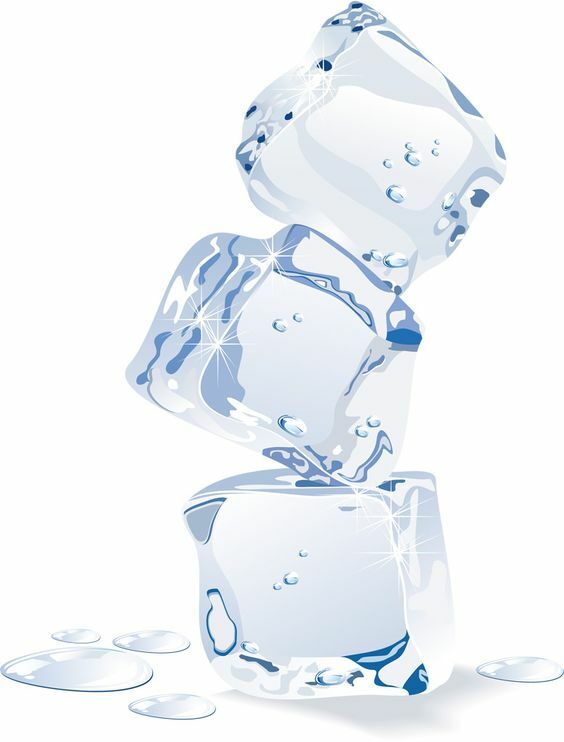 Be careful to not hold the ice cube on the skin too long, which can freeze the skin. 5. Primes The Skin. When you run out of your skin primer, try icing your skin. Icing minimizes the appearance of enlarged pores. So, ice your face and then apply your foundation. You will have the same smooth, flawless looking skin that you would have had you used an expensive primer! If the treatment becomes uncomfortable, stop immediately. Capillaries under your skin can break if they get too cold. If you already have broken capillaries, avoid icing altogether. Do not treat the skin for more than 15 minutes. Icing is meant to be a fast treatment, and your skin can be damaged if not carefully monitored.